Future changes in atmospheric circulation and associated modes of variability are a major source of uncertainty in climate projections. Nowhere is this issue more acute than across the mid-latitudes to high latitudes of the Southern Hemisphere (SH), which over the last few decades have experienced extreme and regionally variable trends in precipitation, ocean circulation and temperature, with major implications for Antarctic ice melt and surface mass balance. Unfortunately there is a relative dearth of observational data, limiting our understanding of the driving mechanism(s). Here we report a new 130-year annually resolved record of δD – a proxy for temperature – from the geographic South Pole where we find a significant influence from extratropical pressure anomalies which act as "gatekeepers" to the meridional exchange of air masses. Reanalysis of global atmospheric circulation suggests these pressure anomalies play a significant influence on mid- to high-latitude SH climate, modulated by the tropical Pacific Ocean. 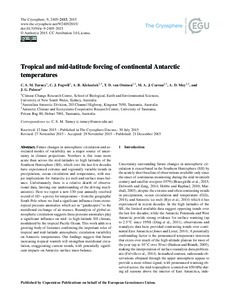 This work adds to a growing body of literature confirming the important roles of tropical and mid-latitude atmospheric circulation variability on Antarctic temperatures. Our findings suggest that future increasing tropical warmth will strengthen meridional circulation, exaggerating current trends, with potentially significant impacts on Antarctic surface mass balance.